The holiday season is upon us and our streets were thronged with locals and visitors alike this past Thanksgiving weekend. There’s always something interesting to see or do in town, but during this time of year you have to wear your running shoes just to keep up. 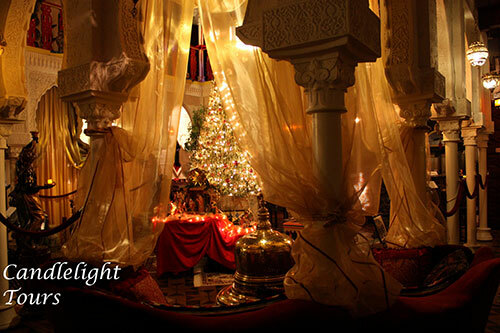 Jim and Marcia Byles, your hosts at the Villa Zorayda are pleased to announce their third annual “Candlelight Tour” offered on select evenings during the Nights of Lights Celebration. The museum is resplendent with its beautiful decorations and the Christmas tree located center stage in the Court of the Lions. On November 29 and 30, tours start at 5:30pm and last approximately one hour and fifteen minutes. During the month of December there are 10 tours scheduled, some offered with refreshments of homemade Christmas cookies, holiday punch and coffee. Docent led, the candlelight museum tour is a trip through history as you learn about the collection and how the Zorayda evolved after years of being a residence. Call 829.9887 or visit villazorayda.com for tickets and information and remember that group tours are available. If you haven’t seen the museum lately, this is your chance. Uncle Stevo and Sue from Simple Gestures invite you to “Candlelight Shopping” at their shop on the corner of White Street and Anastasia Boulevard (just south of Gypsy Cab). The antidote to Black Friday, this is a mellow, gently lit, non-stressful shopping experience where you can buy locally made products and support independent merchants. Refreshments will be offered and your gifts will be phantasmagorically wrapped, tagged and bagged. Join them November 29 and 30 when they will be open until 9pm. Call 827.9997 if you need more info. December 1 marks the 58th annual St Augustine Christmas Parade. Beginning at 10am on San Marco Avenue at the Mission of Nombre de Dios, the parade will wind down through the streets of downtown and end behind the Visitors Center on Castillo Drive. Floats, bands, cars, horses and of course, Santa will be stopping by. Learn more or volunteer to help by calling Linda Abbott at 461.9518. Jean Rahner wants us to know that A Classic Theatre is opening its season with Charles Dickens’ “A Christmas Carol.” This new adaptation by actor/composer Jason Woods is a one-man show bringing to life all 25 characters and accompanied by the original score. In his tour-de-force performance, Woods gives life to the events of that fateful night and weaves together this most riveting tale we all know and love so well. There are 10 performances at the Pioneer Barn at Fort Menendez located at 259 San Marco Avenue. Shows start at 7:30pm December 1, 6, 7, 8, 13, 14 and 15 with matinees at 2pm on December 2, 9 and 16. For reservations call 800.813.3208 or 824.8874. You can also email aclassictheatre@hotmail.com or visit aclassictheatre.org. Lorna MacDonald of the Raintree Restaurant at 102 San Marco Avenue invites us to enjoy America’s favorite humorist and philosopher, Mark Twain, as he pays another visit to St Augustine. Robert Gill offers wit and wisdom in his “Happy Holidays from Mark Twain,” during performances on December 2, 9 and 26. Dinner is served at 6 with the show following at 7. For reservations call 824.7211. Local impressionist and plein air painter, Linda Holmes, will be featured at the Spear Gallery in the Dow Museum this coming First Friday during the Art Walk on December 7. The reception is from 5 to 9 and in addition to three rooms of paintings and other works, there will be music by the Island Duet. Linda reminds you that the gift of art requires no batteries, is calorie free and non-perishable. Ancient City Kids Day has been rescheduled for Saturday, December 8 after Hurricane Sandy forced a cancellation due to windy conditions. This is a favorite event for families and you’ll want to get yourself down to Francis Field between 11am and 3pm to enjoy every minute of it. Call 829.2273 for details. Downtown gallery owner, Karen Sheridan, is pleased to announce “Art on Aviles,” a festive holiday trunk show to be held on December 8 from 1pm to 4pm. Five Aviles Street galleries, including Plum Gallery, Aviles Street Gallery, Worley Faver Pottery Studio and Gallery, Amiro Art and Found and Natural Reflections Glass will offer hand-crafted treasures during this street-wide event. Each gallery will offer light refreshments but if you need more stamina during the event, you can enjoy the cafes and restaurants on the street as well. Pamela Fausset will highlight her Swamp Flower Designs at Plum, Ejo Fox will show off her wearable art in the form of hand loomed scarves and men’s ties at Amiro while sipping on holiday teas by the Spice and Tea Exchange. Gayle Nick’s elegantly framed small images of favorite St Augustine scenes will be at Worley Faver and Rick McAllister will be joining the Aviles Street Gallery with his distinguished photographs of botanicals which you can enjoy while listening to the lively music of Luis Mario Peral. Thank you to the sponsors of this year’s Bed & Breakfast Holiday Tour for donating a portion of the proceeds to help area homeless people train for jobs in the food and hospitality business. First Coast Technical College’s Fresh Start Culinary Arts program is designed to provide training for qualified participants with the intent of graduates going into the fast growing food service/hospitality industry. This favorite weekend tour of our beautiful bed & breakfasts will be held December 8 and 9 from 1pm to 5pm. For more information go to staugustinebandbtour.com, but don’t dally! Our friends from the Original Café Eleven invite you to their 7th annual Big Trunk Show featuring the area’s contingent of up-and-coming fashion designers under one roof. Being held from 7pm to 11pm on December 8, there will be music with live DJs, beer and wine, fashion films, a custom T-shirt print booth and a wide range of jewelry, accessories and apparel from these North Florida designers. Don’t miss having Paper Root, Laurel Baker Jewelry, Standard Collective, Indi Loves Harlie, Jbon Clothing, ReUsed, Rosalie Regalia, Off the Hook Creations, Willow Boutique, Classic Blends, Peaceful Minds and Sunisha Designs all in one place at the same time. The show is held at the Original Café Eleven at 501 A1A Beach Boulevard. Don’t miss the Holiday Pops Concert sponsored by the EMMA Concert Association. Two performances, December 11 and 13, start at 8pm and are being held at the Lewis Auditorium at Flagler College (formerly known as Flagler Auditorium) at 14 Granada Street. Conducted by James Lowe, the Jacksonville Symphony Orchestra will ignite the holiday spirit with favorites including Christmas Overture, Little Drummer Boy, I’ll Be Home for Christmas, Chanukah Suite and many others. Soprano, Hannah Meloy, will be the guest soloist and the program will conclude with a sing-a-long. This is a popular event so get tickets now by calling 797.2800 or visiting emmaconcerts.com. The St Augustine Orchestra is taking “Christmas ‘Round the World,” on December 14 at 8pm in the Antique Courtyard of the Lightner Museum and again on December 16 at 3pm at Christ Episcopal Church at 400 San Juan Drive in Ponte Vedra. Director/Conductor William McNeiland has selected some of world’s most beloved Christmas music for the program and there will be works from France, Germany, Italy, Spain, Poland and Puerto Rico. A group of Latin American melodies called “Salsa Carols,” will be performed and vocalists Caitlin Hannan, and Kathryn Coulter will sing sections from Handel’s Messiah. Get tickets at staugustineorchestra.org. Living history is alive and well at the Mission Nombre de Dios. On December 15, Navidad en el Viejo San Agustin/Christmas in Old St Augustine will offer a holiday heritage celebration with living historians in period garb, Las Posadas which is a colonial Spanish Christmas Procession, a 16th century play, samples of colonial holiday treats and more. The event is held on the grounds of the Mission on San Marco Avenue and you can get more details by emailing info@floridalivinghistory.org or calling 877.352.4478. The 2nd Annual St Benedict the Moor Christmas Fair will be held on the grounds at 86 Martin Luther King Avenue on December 15 and 16 from 10am to 8pm and 10am to 5pm respectively. Funds raised will go towards the continued renovation of the Rectory which is happening one room at a time. The completion of the main floor would add hospitality events for future meetings and seasonal events and you can help by coming to the fair and enjoying games, contests, bingo, the rummage sale along with food, drink and entertainment. Visit facebook.com/sbchristmasfair for more info. Under the direction of Theodore K Mathews, The St Augustine Community Chorus will present “Christmas Reflections” at the Cathedral-Basilica at 7:45pm on December 15 and 16. Started in 1948, this is the first concert of the 2012-2013 season. The Jacksonville Concert Artists will provide the orchestral accompaniment joined by Shannon McKay, organist for the Cathedral. Also joining the event will be the St Augustine Children’s Chorus under the direction of Kerry Fradley. Selections include “Away in a Manger,” “ Go Tell it on the Mountain” and “Ave Maria” with highlights from Handel’s “Messiah” offered in the second half of the program. Jim Goodell will sing bass solos as the guest artist and the audience is invited to sing the Hallelujah Chorus. For ticket info visit staugustinecommunitychorus.org. Jan Miller of the Butterfield Garage Art Gallery wants to thank all the local patrons and visitors for their continued support over the past 13 years. In that spirit, the Gallery is hosting an open house on December 19 from 5 to 9pm where thanks and the spirit of the season will be on full display. Saltwater Property Group is a downtown dropoff for canned goods and non-perishable food for pantries of both St Francis House and Pie in the Sky in Hastings, so if you have a donation, please drop it off at 81 King Street, Suite B (right above the Bank of St Augustine). This is also the dropoff for Sertoma’s Toys for Tots. All toys are distributed to children in St Johns County and we welcome your donations. Our condolences go out to the family and many friends of Jerome Kass – what a rich and wonderful life he had and shared with his community. He will be sorely missed. Our city is packed with visitors who have come to admire what we enjoy every day. Traffic will be slower and the crosswalks will be full, so savor a moment of stillness to appreciate where we live.